The 2019 Keith Millar Provincial B Cup got underway this past weekend across the lower mainland. The eight Preliminary Round matches threw up some early drama and surprises as teams from the Vancouver Metro Soccer League (VMSL), Vancouver Island Soccer League (VISL), Burnaby Mens Soccer Association (BMSA), Richmond Adult Soccer Association (RASA), and the Fraser Valley Soccer League (FVSL) battled it out. The action got underway at Empire Fields on Friday night as VMSL Division 2 Cup runners-up NK Hrvat saw off the challenge of third placed FVSL Division 2A side Abbotsford Utd Lightning 2-1 after extra time. Hrvat now face a long, tough trip to the island on Saturday to take on VISL league and cup champs Gorge Us Guys. Gorge won both VISL’s Division 3B and Challenge Cup, finishing the season undefeated and they’ll be looking for the treble now, Kick off is 4pm at Victoria’s Hampton Turf. Saturday saw three matches. First up was VISL Division 3B runners up Hellas FC playing host to BMSA League Cup winners Bacardi FC at the Pacific Institute for Sports Excellence in Victoria. Home field advantage proved crucial for Hellas as they ran out 3-1 winners, setting up a trip to the valley to take on FVSL Division 2A champs Abbotsford United B on Saturday afternoon. Kick off is at 4pm at Matsqui Recreation Centre Field 3. RASA League Cup winners Graduates FC were handy winners at Empire on Saturday afternoon, comfortably getting past VMSL side Meraloma FC 5-1. That win sets up a First Round match up at FVSL Division 2B champions Abbotsford SA Red Devils on Saturday evening. Kick off for that one is 6pm at Abbotsford Secondary School. 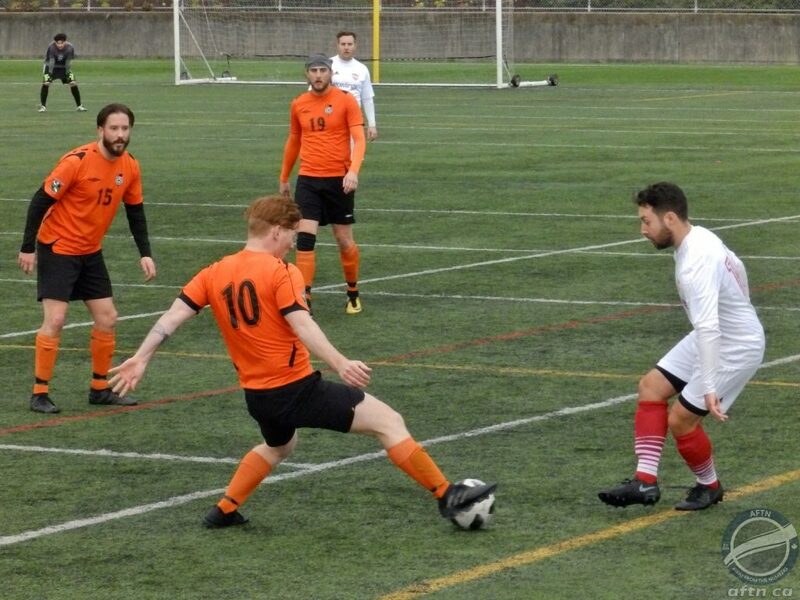 We headed along to Saturday’s final match at Burnaby Lake, where BMSA side Mundiavocat FC took on VISL Division 3A champions Prospect Lake Lakers. A goalless first half already had you feeling this one could be going the distance but Mundiavocat started the second half strongly and took the lead four minutes after the restart. It was a lead that was to last just eight minutes and before the islanders tied it up again. But with no other goals in either normal or extra time, the match headed to penalties and that was where the real drama started. Prospect Lake looked to be coasting when Mundiavocat missed their first two penalties and they converted theirs. The teams both scored their third ones, but with the pressure on, the Burnaby side converted their final two kicks of the initial five, while the VISL missed theirs, sending the game to sudden death. Both teams missed their sixth penalties, before Mundiavocat went ahead for the first time in the shootout with an excellent seventh spot kick. The pressure was now really only the VISL and a high blast over the bar saw the Burnaby side triumph and advance to the next round 4-3 on penalties. Mundiavocat will now fancy their chances in the next round when they travel to FVSL PMO Titans on Sunday. The Port Moody side finished fourth in their division. Kick off is 6pm on Port Moody’s Trasolini Turf. Sunday saw the final Preliminary Round matches take place. The action kicked off at Confederation Park in North Vancouver, where VMSL side Shaheen FC were 4-1 winners over FVSL side Mission SC, in a closer game than the scoreline suggests. Shaheen now face BMSA League and Rudolph Cup double winners Impero Calcio at Burnaby Lake West (Field 1) on Saturday afternoon. Kick off is 5.30pm. There was success for FVSL’s Surrey United SC however, as they eased past Richmond All Blacks from the RASA 3-0, and it could have been more. They’ll face a much trickier test in the next round when they face a strong VMSL side, FC Serbia United, on Sunday. Kick off is 2.30pm at Burnaby Lake West (Field 3). VMSL Division 2B champions Westside FC Sierra headed into the valley to take on FVSL side Langley Utd Dynamo at Yorkson Field and come away with a 4-0 victory. Langley were tired from having to play a FVSL cup final the day before and between that and missing some key players, they couldn’t hold off a late surge from the Vancouver side. Sierra now take on RASA League champions AC Richmond in what could be the match of the round at the Minoru Oval on Friday night. That one kicks off at 8.30pm. 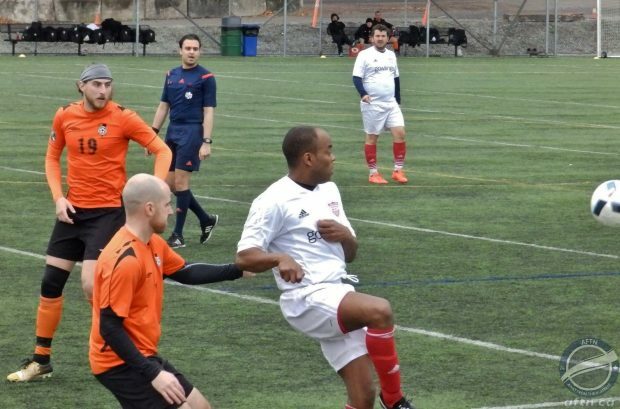 The final match of the Preliminary Round saw an all-VMSL affair at Burnaby Lake and it also produced the shock of the round as Euro FC saw off VMSL Division 2A champions, and defending Keith Millar Cup champions, Vancouver Strikers. Strikers had most of the play and when Euro went down a man late in the game, the writing looked on the wall. But a breakaway goal against the run of play sent Euro through to the next round where they’ll face VMSL Division 2 Cup winners Metropolitan FC. Kick off for that one is 6pm on Sunday up at the University Hill turf.